The stage-propped pine trees began to emerge from the dark haze and a soft red glow shined through the wooded mirage. From the artificial trees there seemed to be a soft buzzing of crickets which began to fill the stirring theatre. Suddenly, out of the mist, Kid Cudi appeared, clad in comfortable black sweats and a beaming grin. The theater then filled with the spacey vibes of “Baptized in Fire,” a feature off of Cudi’s most recent album, “Passion, Pain, & Demon Slayin’.” The crowd immediately began to sway with the loud bass tones while cheering on their hero. On Tuesday Oct. 3, Kid Cudi performed at the Oakdale Theatre in Wallingford. Although the theatre was nowhere close to full capacity, the small crowd was not lacking in enthusiasm. 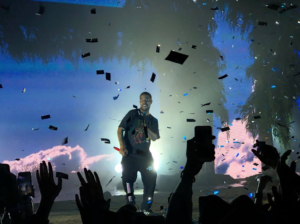 Quinnipiac junior Vincent Guarino was in the general admissions pit, up close and personal with Cudi. Perhaps more special than the concert itself was the timing of the event. The concert came just one day shy of a year since Cudi announced his checking into rehab due to a personal health battle. On Oct. 4, 2016, Cudi went on Facebook and released this message to his fans. 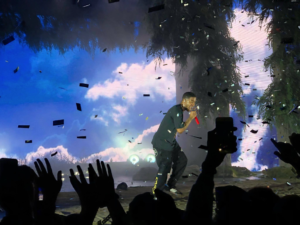 A year later the comeback kid, Cudi, took the stage at Oakdale and put on a 17-song set to an ecstatic crowd. The performance was pure positivity. Cudi pulled out all the show stoppers as the crowd responded more and more to his contagious energy. Guarino, a big fan, was glad to see Cudi back at it. “It was great to see him on stage with a huge smile on his face and just happy to be back with his fans,” he said. The setlist weaved in and out of his early works and all the way through to “Passion, Pain, & Demon Slayin’,” released right after his checking into rehab. Cudi performed cult favorites and singalongs like “Pursuit of Happiness,” “Marijuana,” and “Mr. Rager.” New jams, “Kitchen,” “Rose Golden” and Kanye West collaboration “Father Stretch My Hands Pt. 1” contrasted the old hits. Even a few club hits turned the theatre into a rave for a few crazed minutes when “Memories” and the sirens of the Crookers remix of his breakout single from 2009, “Day N’ Nite,” rang out. Guarino was just as astonished as the rest of the crowd when Chip materialized to the mesmerizing stage. As the night went on, the crowd and Cudi bonded over all the love and support in the air (not to mention weed). Cudi even stopped multiple times in between songs to sign CDs and other mementos from the GA crowd. When the set was nearly over Cudi went on a spirited monologue to his dear fans. The moment was received by many cheers of, “WE LOVE YOU CUDI!” from the crowd which then rose into a crescendo of a thousand cries of joy as the opening hymns of Pursuit of Happiness begun. It’s no coincidence that “Pursuit of Happiness” has been Cudi’s most-streamed song on Spotify with 178 million plays, as it intimately walks listeners through Cudi’s struggle between his highs and lows. “My favorite moment of the concert was when he played ‘Pursuit of Happiness’ because it was one of my favorite songs that he wrote,” Quinnipiac junior Zach Leichter said. In an interview on Arsenio Hall’s show in 2014, Cudi expressed the purpose the behind the music he makes. At the end of the day, Cudi’s show at Oakdale Theatre was uplifting. His fans were steadfast all along and made for an incredibly intimate concert.